You will find the beaches of Turkey to be some of the most beautiful in the world. Each has something to offer and are a unique blend of history, natural wonder, and culinary variety. Moving round the Turkish coast anti-clockwise the first resort worthy of mention is Cesme and Alacati which is popular for its fine sandy beaches, mineral springs and ideal wind conditions, making it a popular centre for kite-surfing, sailing and windsurfing. Some of the nearby beaches include the out of town Long Beach, a 6 km stretch of sand or the sandy beach of Kustur 5 km to the north. Further down the coast is the international port of Kusadasi with its well known Ladies Beach, useful for its vicinity to the biblical site of Ephesus and for its shopping opportunities and lively nightlife. Bodrum with its whitewashed houses cascading in bright pink bougainvillea is well loved as one of Turkey’s most trendy and sophisticated resorts with blend of history, proximity to a vast array of fantastic beaches, fishing villages and hip nightclubs. The views of the city are exceptionally striking against the stunning backdrop of the Castle of St.Peter which stands formidably between the city’s twin bays, making it a magnet for yachtsmen too. For those who prefer a more intimate setting Bitez, Gumusluk, Turgutreis and Turkbuku and are just a bus trip away from Bodrum, offering swimming, intimate restaurants and water sports in a more laid back setting. Marmaris, a favourite with British tourists, is a lovely seafront of restaurants and cafes against a backdrop of pine-clad hills with beaches just out of town. A buzzing resort, if the beaches get too crowded there are hotel pools as an alternative and the town really comes to life after dark. It is possible to take a day trip to the Greek island Rhodes just a few hours away by boat. The nearby Icmeler boasts the best beach in the area a sweeping bay of coarse golden sand with a variety of water sports on offer. Further along the Loryma Peninsula, Datca is a popular stopping off point for gulet cruises and yachts as it is relatively difficult to access by road meaning it has retained much of its unspoilt beauty and authentic atmosphere. There are some beautiful beaches nearby including the bays of Aktur and Kargi. The most famous beach in Turkey has to be Oludeniz near Fethiye, a serene lagoon beach with turquoise waters that graces the cover of so many holiday brochures. There is a small entry charge to use the lagoon beach, where only non-motorised sports are allowed. The main resort beach is free of entry charge, is the long stretch of shingle known as Belcegiz Beach. Fethiye with its backdrop of cliffside Lycian tombs is a bustling centre with a sandy beach nearby at Calis and the much-renowned Oludeniz lagoon with its crystal clear waters close by. Nearby to Dalyan is the unspoilt Iztuzu Beach which can be reached by boat. Patara Beach is a 12 km beautiful white sandy stretch voted as one of the top beaches in the world by Times Online, Best of 2005 and known as the widest beach of the northern Mediterranean. Backed by mountains and bordered by sand dunes, mimosa bushes and the large marshy area which once was the harbour of Patara, this beach is part of a national park and a key biodiversity area, rich in birdlife and the breeding ground of the endangered Caretta Caretta. The Turkish Riviera is the most stunning part of Turkey’s Mediterranean coast with its perfect sun, clean beaches, ultra luxury resorts, nature and history. The Turkish Riviera city of Antalya set around a Roman harbour and old town is the main resort on the southern coast of Turkey; its long holiday season and warm waters can be enjoyed on the long stretches of beach just outside the town centre and there are too many activities available to mention, windsurfing, waterskiing and sailing to name a few. Further along the coast Alanya, with its vast beaches, historical sites, caves reachable only by boat, hotels and motels, cafes and bars is one of the most popular and developed resorts of the Mediterranean coast. Nearby Side has a long stretch of golden sand, known as Kumkoy or sand village. Think you know all the best beaches in Turkey? Think again. White sandy stretches can be found in Antalya, Mugla, Aydin, Izmir, Balikesir, Mersin, Canakkale and Sinop, undeveloped coastlines of Turkey and an environmental award-winning beach on the Aegean, Mediterranean, Marmara and Black Sea Coast of Turkey. Patara is the longest beach in the Mediterranean, and was hailed by The Sunday Times as the best beach in the world. Accommodations are limited, loungers and umbrellas are available to rent, and it is backed by ancient ruins. If you want a more relaxed, romantic atmosphere, this is the beach for you. It is far more secluded and smaller than the other two beaches mentioned so far, and is backed by a forest, which is filled with Roman ruins. Iztuzu Beach is a national conservation area, and is one of the last breeding places in Europe of the Loggerhead Sea Turtle. It can only be reached by a 20 minute boat ride from the nearby town of Dalyan. There is a lot of beach, and the water is warm and shallow. Nearby, there are some cliff tombs you can explore as well. 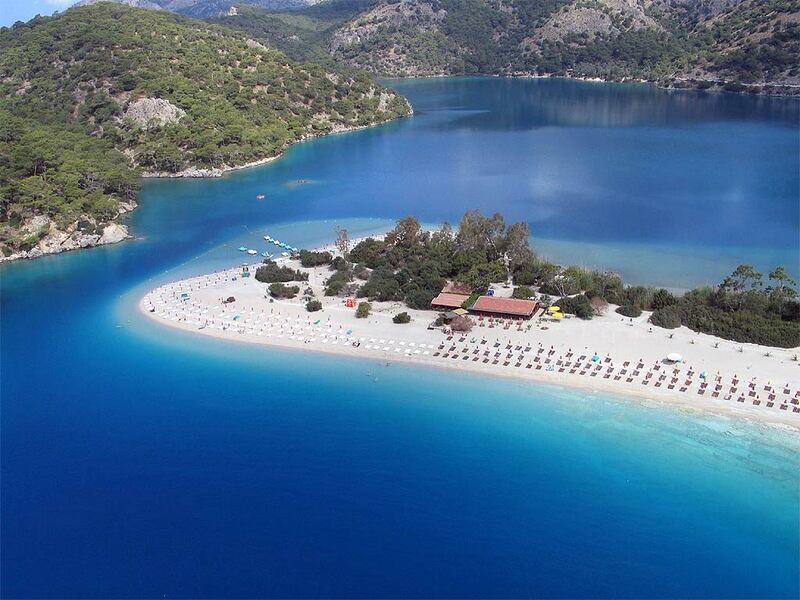 Oludeniz is Turkey’s most famous beach, and therefore in peak seasons, is the most crowded. There are good hotels to stay at, very good bars, water sports available, scuba diving and is surrounded with resorts. Side is only an hour away from the airport, and is very popular with holiday groups. There is a village and a beach filled with fine sand, as well as some Roman ruins to explore nearby. Bodrum is home to the original mausoleum, which is one of the Seven Wonders of the World. It is also home to the Castle of St Peter, which used to be a crusader fortress but now serves as the Museum of Underwater Archaeology. The beaches in town are small, but many people visit them as an afterthought to sightseeing. Kemer is basically a seaside town built along the sea. There are a number of small beaches you can visit, as well as many day-trip opportunities. Most of the beaches are made up of small pebbles, although there are a few with sandy beaches. Alanya is one of the biggest resorts found in Turkey, and Cleopatra’s beach is splendid and very popular. The beach and resort offer great accommodations, facilities and things to do. The beaches of Alanya are so long almost 22 km to the east that there’s plenty of sand for everyone. There is also an old Great Seljuk castle nearby. Most of the beach is public, but on the south side there are some resorts. It is close to the Aqua Fantasy water park, and there is a small hotel where you can get refreshments and amenities. The water is pretty choppy, and there aren’t any life guards, so be careful. Icmeler bay is located on the Datca peninsula. The town is surrounded on three sides by pine forests. Don’t expect a booming nightclub scene in Icmeler. If you enjoy water sports such as water skiing and diving, then Icmeler is the place for you, that is a huge plus. Take a boat trip to a nearby island, savor fresh seafood in a beachside café, or just soak up the sun. Sinop has many fascinating things to see, and the beaches are small. Nice beaches, never crowded, because the Black Sea water is usually pretty chilly. Davutlar beach is located on the Kusadasi near Dilek Peninsula National Park. Turkey has the extraordinary beauty of the Mediterranean coast and beaches with the most important holiday resorts. Turkey is one of the countries with the longest coastline on the Mediterranean Sea from May to October is intense tourism. Nature, history and had many great moments on the beach visitors over the blue of the sea combined.